The market has entered 2019 as volatile as it ended in 2018. 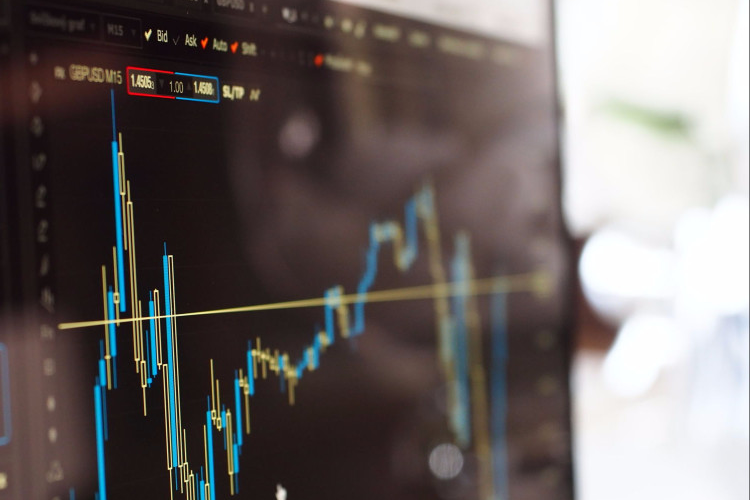 While the broader averages ended down for the year in 2018, the past two weeks have seen some measure of bullish behavior. The S&P 500 is up more than 3% so far, but lackluster earnings reports could quickly derail the uplift. Instead of trying to guess whether we’ve entered a bear market or if it’s just a correction and the economy is doing fine, investors are better off playing a little defense in their portfolio. There’s no reason to bail out of the market and give up but doing a bit of risk mitigation isn’t a bad idea either. One consumer staple offers investors the defense they might be looking for but has made strides to bolster long term growth and investor’s profits for the future. The Kroger Co. (KR) is a $23 billion grocery store conglomerate, the largest supermarket chain by revenue and the second largest general retailer behind Wal-Mart. The company operates roughly 2,765 stores located in the Midwestern and Southern United States. The company reported a third-quarter earnings beat of $0.48 per share compared to the analyst’s estimates of $0.43 per share. The brightest spot for the quarter was the 60% spike in digital sales – a positive note for a company that’s been investing in technological solutions for shoppers. One catalyst working for Kroger is its dedication to technological innovation. With consumers preferring a technological shopping option for their retail needs, the company has launched a program intended to appeal to changing tastes. The pilot program gives shoppers a digital display that tells them where an item is located, its price, and sales on that item, and more. It also offers a check-out free way to shop, giving them a more convenient way to buy groceries. The stock trades cheaply at just 12 times earnings compared to the industry average of 18 times earnings. The 7% long term EPS growth rate gives it a PEG ratio of less than 2 as well which means that the stock isn’t overvalued at the moment. As with most consumer staples stocks, Kroger carries a 2% dividend yield giving investors some measure of downside protection as well. From a technical aspect, Kroger’s chart reveals a current price point that’s right in the middle of most indicators. The long-term trend is still showing bearish, while the short term is bullish. If that strength continues, Kroger could see some positive momentum begin to take hold. Based on Kroger’s full-year EPS estimates, this stock should be fairly valued at around $32 per share – a gain of more than 12% without considering the dividend. For investors looking to stay in the market but wanting to stay conservative, Kroger is a tempting buy. The above analysis provided by Daniel Cross, professional trader and financial writer. 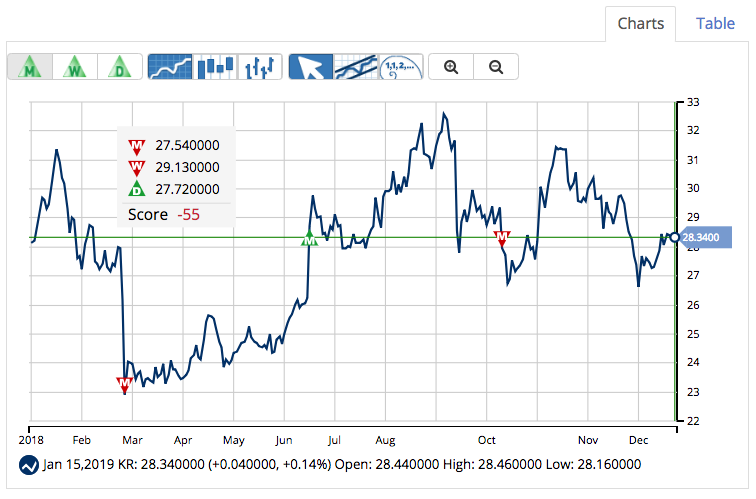 MarketClub’s technology is showing that Kroger is not currently trading within an established trend. The intermediate-term trend and long-term trend has been choppy. This is why the Smart Scan score for KR is rated at a -55. Members, add KR to your watchlist and set your alert so you’ll know the second our technology detects strength for this stock. Not a member? 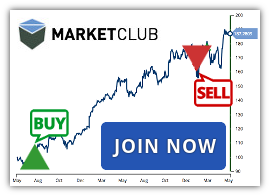 Get exclusive analysis and signals for KR when you try MarketClub for 30 days.